Basically is when a company/brand share what their website is all about, through their owned social media networks. This is an effective way to promote their products as this can drive traffic to their social media, and have conversions. Also this gives a company a platform to share how the product can be use or give the consumers ideas. The link below goes a bit more in depth on what is social sharing and how it’s beneficial. Now I will be discussing a few clothing companies that participate in social sharing and have caught my attention because they do an excellent job on it and I think everyone can learn something from their social sharing skills. Forever 21 is a widely known retailer for young women and men. It seems like this company is targeting their consumers widely through different platforms for example they are active on Youtube, Instagram, Facebook, Twitter, and Snapchat. Although they have the largest amount of following through their Facebook and Instagram which is around 15 million followers for both. This is most likely due to their consumers being highly active on these social network. Although, it seems that the sharing of pictures and videos is the most effective way of sharing their content because consumers can visually appreciate what their brand is all about, without having to read through it. Though these social media platforms it shares different type of content like style inspiration, relatable memes for followers, current store or online site events, and more! Missguided is a clothing brand that originated in the UK and they are known for eye catching pieces. On their social media they share images of influencers wearing their clothing pieces. Also they share when they have sales, and have a lot of giveaways. Although what’s interesting is that they also post beauty content that doesn’t relate to their website products. They post constantly on Instagram, Facebook, and Twitter. I believe that they chose the right social media platforms to share their content, as they are trying to reach young adult females. And they share high quality content that their consumers find interesting. Nasty Gal was founded by Sophia Amoruso in 2006, and it has been growing pretty rapidly since then. They currently have over 7,000 post on their instagram feed because they post frequently. As well as their other social medias like on their facebook, twitter, pinterest and youtube. 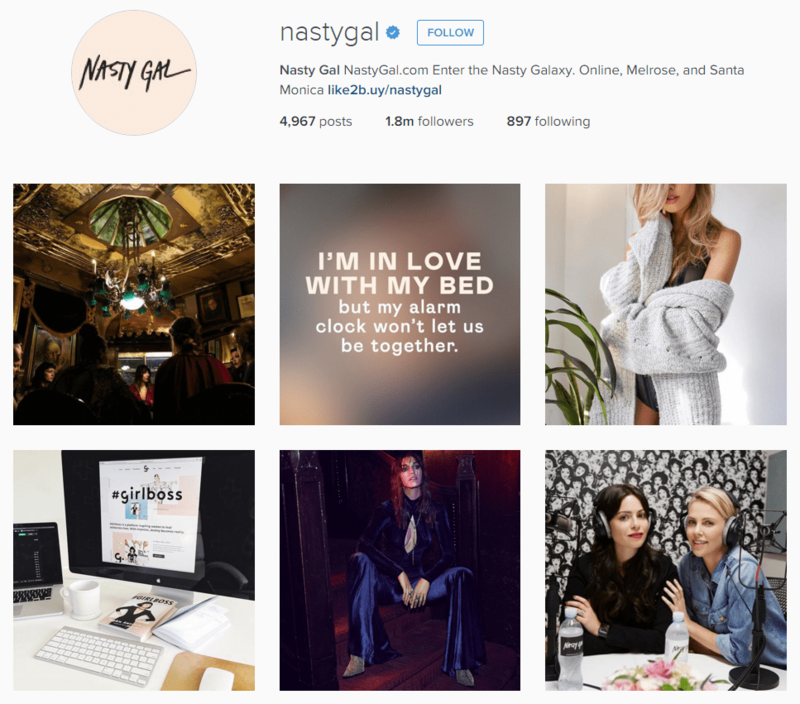 As I compared both feeds of Nasty Gal and Forever 21 I came across the fact that they are similar in some aspects. For example they both have memes or relatable quotes about life. These post do not have much to do about their website. I think these post are made to make their followers feel that their social media is relatable to their life. I actually believe this is a good strategy to gain followers and gain attention. As I that the memes/ quotes usually get noticeable more likes and comments than post about clothing pieces. In conclusion these brands understand well what social sharing is and they are great examples to take in consideration when looking for social sharing examples.